He will wear the number 7 jersey at Eastlands. Sterling was at Liverpool for five years. THE SUMMER’S LONGEST running transfer saga has reached its conclusion after Manchester City confirmed the signing of Raheem Sterling from Liverpool in a deal worth up to £49 million. The 20-year-old has signed a five-year deal at the Ethiad Stadium and will wear the number seven jersey. He will join up with his new team-mates on their pre-season tour of Australia in the next 24 hours. Sterling overtakes Andy Carroll as the most expensive English player. “Raheem Sterling is one of the best attacking players in world football, and I am very much looking forward to him joining our squad out in Australia later this week,” Manuel Pellegrini said in a statement on the club’s website. The England international has been at the centre of a contract stand-off after he turned down a new £100,000-a-week offer by the Anfield hierarchy in April. Since then, his future has been a source of endless speculation with various clubs linked with the former QPR winger. 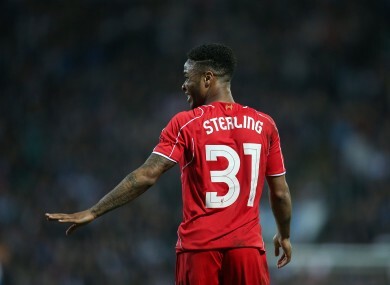 As his relationship with Brendan Rodgers and Liverpool became increasingly fraught, it was almost inevitable that Sterling would get his wish and force a move away from Merseyside. In a statement on their website, Liverpool said: “Liverpool Football Club can confirm Raheem Sterling has completed a transfer to Manchester City. City twice attempted to buy Sterling earlier this summer, but saw both of their bids rejected before a third and final offer, totaling £44m up front plus a further £5m in add-ons, was accepted at the weekend. After moving to Anfield from QPR in 2010 for £600,000, Sterling went onto make 129 appearances for Liverpool, scoring 23 goals. Email “Sterling completes Man City move to become most expensive English player ever ”. Feedback on “Sterling completes Man City move to become most expensive English player ever ”.